← Love London, Go Dutch – should this be about ‘choice’? Love London, Go Dutch – Safety In Numbers? Yesterday I wrote about a potential area of weakness in London Cycling Campaign’s Go Dutch strategy; the principal objection was that in maintaining that cyclists should still be able to choose whether or not they use the road, or cycle tracks, compromise on the quality of those cycle tracks becomes harder to resist, especially as the Mayor seems to view off-carriageway provision as some kind of ‘training’ facility for nervous cyclists, before they venture onto the road. In other words, some streets could become ‘safe’ in virtue of the number of cyclists using them, rendering infrastructure unnecessary. Now, there may be some truth in the ‘safety in numbers’ effect; it certainly seems to apply in nature, where the members of flocks or shoals tend to be statistically less likely to fall victim to a predator than if they were travelling alone. This ‘shoaling’ effect, however, may not be quite so helpful in discussing cycling, because cyclists only travel intermittently, and by chance, in shoals. Quite often they will be travelling alone. The other interpretation of safety in numbers is that drivers are more likely to spot cyclists if they are more used to their presence; they are more likely to expect and react to them. This assertion is a little shakier; indeed a case could be made that it is what is unusual that would prompt more care from drivers. The standard graphical demonstration of a correlation between numbers and safety (originating with Jacobsen) is not as helpful or instructive as it is often made out to be, because, as we all know, correlation is not causation. The greater rate of cycling in some European countries could be a result of more safety, rather than their greater safety arising from their greater numbers. In addition, and even more problematically, the graph simply fails to take account of a wide range of variables that might also have an effect on cyclists’ safety, of which, perhaps in order of importance, we could name physical infrastructure, policing, speed limits, even (if we are looking at a rate of cycling fatalities) quality of emergency medical treatment. Even if we do accept the potentially flawed logic that safety can simply arise from numbers, it is problematic to adopt it as a guiding principle in determining whether or not a street needs infrastructure, for several reasons. Firstly, it ignores the fact, apparently appreciated by LCC, that infrastructure is needed primarily for reasons of subjective safety – to make the experience of cycling seem safer and more pleasant. ‘Safety in numbers’ does little or nothing to achieve that effect, although it may, arguably, have some effect on objective safety. There was a clear demonstration of this when I left the Yorkshire Grey, after this very talk. Heading towards Farringdon, I was in the company of several cyclists, but that did not prevent me from being subjected to some honking and a close pass from a lady in a Mercedes as I passed another cyclist down the hill. It wasn’t very nice. The road was no more pleasant for a novice to cycle on than if he or she had been completely on their own, and for that reason alone ‘safety in numbers’ shouldn’t be a reason for deciding not to change the environment. A requirement of infrastructure is to make the cycling environment more pleasant; this cannot be guaranteed by ‘safety in numbers’. Indeed, if you listen to the audio of the talk, it is punctuated by the roaring of engines, and honking – despite there being plenty of cyclists passing through at that time of the evening. The environment remained deeply uncivilised for cycling, and hostile to any nervous person; cycling on a road busy with motor traffic is usually just as unnerving whether you are on your own, or with a handful of other cyclists. ‘Safety in numbers’ is not a way of making an environment subjectively safe in a way that cycle paths can, and it should not be proposed as a substitute for them. The other problem, as alluded to earlier, is that the ‘numbers’ that are proposed to guarantee the safety of cyclists, by the ‘shoaling’ effect, are never uniform, peaking only for a few hours at the start and end of the working day. There will be no ‘safety in numbers’ later in the evening, or during the day, when cyclists will quite often be travelling completely by themselves. I do not expect that just a greater number of cyclists will on its own result in a risk reduction for the cyclist. On the other hand, I do expect that more cycling facilities will lead to lower risks. 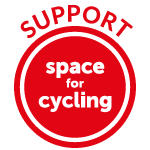 Policy that only focuses on an increase in cycling and at the same time ignores the construction of more cycling facilities, will not have a positive effect on road safety. Mr Mayor…. would you concede that a significant but often undervalued element of cycle safety is the herd immunity: the idea that, as increasing numbers of people cycle, the other road users become more used to cyclists, become aware of cyclists in their day-to-day driving habits and adapt their driving styles to accommodate cyclists? we need to hear some voices also making the key point that… that cycling is a good thing to do and it is becoming safer. The idea that there is safety in numbers and that you can create a culture of cycling is certainly right. Relying on ‘safety in numbers’ is a particularly appealing strategy if you don’t really plan to do much for cycling, and cycling safety, beyond ‘encouraging’ people to take up riding a bike. It’s also a good way of being able to dismiss the claims of those who say that cycling is subjectively dangerous; the idea being that if you talk about how unsafe cycling feels, you discourage people from cycling, and hence make it ‘more dangerous’ by suppressing the numbers (this is the logic of this piece by Andrew Gilligan, and many others that have appeared in a similar vein). It’s consequently a bit disappointing to see LCC potentially presenting it as a viable alternative to actually making streets subjectively safe for cycling. They have a great campaign, and some form of commitment from London’s politicians to start implementing it. For that reason I think they should be very wary of talking about ‘safety in numbers’ and its potential positive effects, because Boris is more than willing to ‘rely’ on it, instead of making changes where they are necessary. This entry was posted in Boris Johnson, Go Dutch, Infrastructure, LCC, London, Safety In Numbers, The Netherlands, Transport for London. Bookmark the permalink. 15 Responses to Love London, Go Dutch – Safety In Numbers? In the case of flocks of birds etc, ‘safety in numbers’ reduces the risk that an *individual* will suffer, but does *not* reduce the *overall* risk that *someone* will suffer. Predators will still strike, and they’ll strike just as many times, there’s just less chance that they’ll strike you in particular. I wonder how this lesson might be applied to cycling’s alleged ‘safety in numbers’. Surely the better way would be to promote the sustainable safety approach? Remove the conflicts between cyclists, motorists etc. and it makes it safer for EVERYONE? How does “safety in numbers” philosophy apply to a situation outside of bicycle rush hour? I’ve cycled Theobalds Rd a couple of times when there were hardly any bicycles around and it was a bit of a nightmare. And how does safety work for kids cycling around? 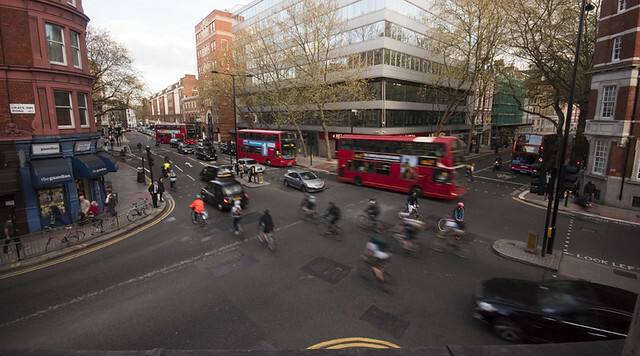 For me a smart strategy would be to create continuous routes where the demand currently exists – they need to be good enough because they will draw more cyclists (from other routes) and we can see such effect on Cable St which at times becomes overcrowded. Piecemeal approach will achieve nothing. “Safety in numbers” is an outcome of very large numbers of people riding bicycles. It is useless as a way to encourage every ordinary person to start using a bicycle for transport. One way it works is by cyclists out-numbering motor vehicles, as during Critical Mass events, but as others have commented, these out-numbering events are few and far between. At other times, and on other routes, cyclists are as frightened and vulnerable as normal. The other way it works is by motorists often also being cyclists, and that only happens when you have significant modal shares for cycling, and cycling being an every-day mode of transport for ordinary people. We’re talking 40% modal share, and cycling being ordinary, at which point the war on motoring is already won. Trying to encourage ordinary people to ride a bike for local journeys by talking about “safety in numbers” and the fact that “cycling is statistically safe” just doesn’t work. Why should Fred risk life and limb in order to make cycling a teeny bit safer for those other brave people on bikes? Who, apart from the keen cyclists, is willing to brave the danger from motor vehicles to get enough cyclists out on the street to make it safe? There is a boot-strap problem. Which is why cycling in places that require, and even train, people on bicycles to put themselves directly in the path of motor vehicles has remained at very low levels. There is quite good experimental data that suggests that the eye only sees what it is looking for. The eye does not work like a camera – taking in the whole image in one go – but instead constantly flits from one part of its field of vision to another each time only ‘seeing’ a small part of the whole. The brain then fills in the remainder of the picture with what it expects to be in those parts of the field of view that are not being ‘looked at’ at that particular moment. (I know it sounds bizzare and counter-intuitive, but this is the way the eye works). The most dramatic example of this is the famous ‘dancing bear’ film. The observer is asked to concentrate hard on counting the number of times a ball is caught and in doing so the vast majority of observers fail to see someone in a bear costume dancing in between the people throwing the ball. I agree that there are many other things that need to be done to make cycling a more pleasant experience, but training drivers to be actively looking for cyclists (including by increasing their expectation that there will be cyclists in their vicinity) would make a difference. Have seen that bear clip (and missed it first time!) and some clips on how the eye works as you describe. Given that I think it’s ever more clear that separation should be the way forward, even with drivers and cyclists paying attention we are all still human and as such can make mistakes. Mistakes which can lead to accidents. The problem is then that it’s invariably the cyclist who will always come off worse. Maybe my wording was unclear, but I wasn’t disputing the effect you describe, merely pointing out that there could also be a countervailing effect, namely that when a person is more used to seeing cyclists, they might drive more casually around them. Anecdotally I tend to find people drive closer to me, and to take more risks, when I’m cycling in London, then when I’m cycling around Horsham, where we are not quite so common – although of course there are plenty of other variables that might account for this. I agree. Being normal on a bike results in regular near misses and SMIDSY moments, as we all know. When I used to commute by normal bike I’d reckon on two or three nasty moments per week. Then I started riding a Windcheetah recumbent – something extremely unusual. The change was large and surprising: the recumbent made SMIDSY a thing of the past, and nasty moments were reduced to perhaps one a year. The effect worked for people pulling out of side roads as well as passing from behind. Of course as well as being unusual, the recumbent also appears low and wide, and “dangerous”, and those might be more the effects in action. I get a bit more respect from motorists when towing a bike trailer, but I think the “dangerous” look of the recumbent generates lots of nice risk compensation in drivers. Safety in numbers may increase the probability of seeing a bicycle P(seen) but is no guarantee the driver cares P(care). Whenever some car comes up behind you honking it’s seen you -but doesn’t care. when a car turns in front of you, when it left hooks you, when it pulls out of a side road while looking at you, it’s choosing not to care. Whena driver changes 3cm into the other lane and then cuts in right in front of you swearing as they go past -seen you, resent you. Which for a large proportion of the near-miss events I encounter appears to be a big chunk of the problem. Its also why hi-viz and lights have a finite value. Just because you are seen doesn’t mean the driver will do anything. What may be a factor in the NL and elsewhere is this: the driver themselves or friends and family cycle enough that they do start to care. Without that state in the UK, you still get cut up by drivers who don’t care, even if they see you dressed up like a bollard. What to do? How about making the drivers care by something like enforcement of rules. Careless driving is one such rule. What we need is more police on bicycles, more enforcement of vidoed near misses, taxi authorities to act on complaints (they do in Bristol). To be fair to LCC, they don’t really have any option but to raise “safety in numbers” as a solution, even if only to have it shot down in flames. The way government is supposed to work is that all options are considered and costed and a fair and balanced decision is made (yeah, right). You are doing excellent work in exploding the argument but it also needs to be made through official channels so that TfL and the Mayor take it on board. I don’t entirely share your view about perceptive safety in numbers – I think you can feel safe just by being in a herd, as Critical Mass demonstrates. OK, there is always the occasional arse who has to try and bully their way through but it is damn hard for them to manage. Apart from the monthly events, you may see critical mass in a handful of other situations: 30 seconds after the end-of-shift hooter in a dockyard, for example. I remember what an impressive sight the gates at Portsmouth naval dockyard used to be then. But Critical Mass sums it up really. Talking about safety in numbers is attempting to dilute the critical mass argument to much lower cycling densities. If we could achieve critical mass, we might well be sorted, but what about the distance in between? Unlike subatomic particle physics, you cannot go from one state to another with liteally nil time spent in between. I am familiar with Theobalds Rd as that is how I get to Lambs Conduit St when I visit my bike mechanic (Bikefix – excellent shop). It is pretty horrible, especially at the Southampton Row end. I am not sure I know how it can be fixed. Is Dutch style infrastructure really just about subjective safety? Or is it about actually reducing the number of KSI? It rather depends on whether you think we have anything to learn from the Netherlands about safety, I tend to get the felling that there are many in the “road safety” lobby and certain cycle groups who think that we don’t and they don’t really care either. Being a dotty old gran, I object to being used as a human shield for all those cyclists who think safety in numbers is the answer. Numbers only make it safe on those rare occasions when there are enough to slow the motors almost to a standstill, like on Critical Mass. I need to know there are safe routes out there so that I can feel comfortable about my daughters and granddaughters travelling in London by bike. They won’t always be able to wait for a passing shoal of cyclists to sweep them along.